This weekend was opening football season for Ole Miss with kick off at 11 am. We had family and friends coming in for the weekend with their kids. Typically we would have tailgated at The Grove but with such an early game, I decided to tailgate in my kitchen. With a full house of overnight company and 16 coming for breakfast brunch at 8 am, I needed to do my main cooking the day before. Breakfast Casserole seemed a good choice as it could be assembled the night before, refrigerated, and just popped in the oven that morning. Now, I seldom just pick a recipe out of a cookbook or go straight by it, and there were several good breakfast casseroles in my recipe box. Problem was, I didn’t want to make another trip to the grocery. I had some sausage, some ham, some bacon, and 3 different types of cheese but not enough of any one to make the casserole. Thankfully there were eggs or I would have been up a creek. So after reading several recipes, I went to work designing and preparing a new Deluxe Breakfast Casserole for my crowd of Rebel fans that fit the ingredients in my fridge. I woke up at 7 am and popped the casserole in the oven. While it baked I prepared fresh pineapple slices, grapes, and strawberries in a bowl. There was room for 2 trays of Sister Schubert Cinnamon Rolls on the bottom rack that went in the last 10 minutes. 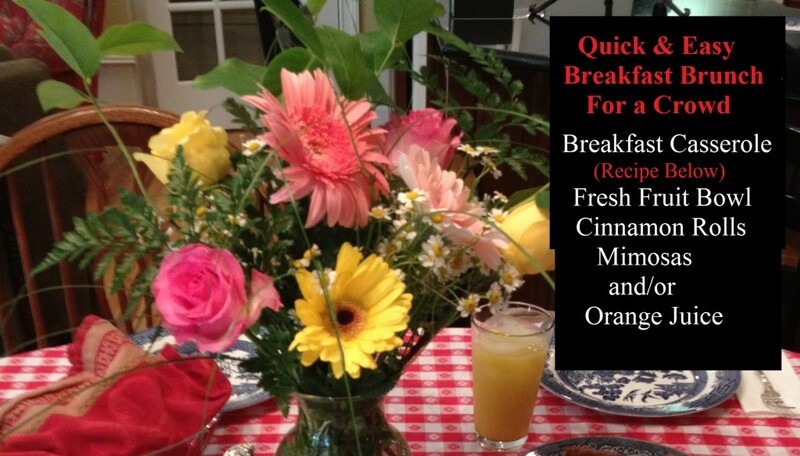 My Breakfast Brunch was ready when my crew began to stir and in town guests arrived. Only problem, I was so busy entertaining, I forgot to take pictures. One young guest was quite skeptical of trying the casserole. I asked him “Do you like eggs?” “Yes” he said. “Do you like bacon? “Yes mam” How about Ham? “Uh huh” Sausage?” “Oh yes!” “What about cheese?” “Yes!” “Well then” I said “You’ll like my Breakfast Casserole” He did!! Caught him coming back for seconds! My other little cousin told me it was the best breakfast casserole I had ever made and I better hurry up and write down the recipe cause he sure was hoping I would do it again. So here you are No Time 2 Cook fans. Click here for the recipe and enjoy!! And let me know how your’s turns out. I served my Mama’s Grits, too. Click here for that recipe. You’ll never cook grits any other way again. By the way! Everyone had a great time, especially the kids. What kid wouldn’t with a score of 76-3 with their team winning. Hope your team won this weekend, too! Happy Football season and tailgating ya’ll!